The KFC Yum! Center is fully equipped with ADA Accessibility entrances and seating. 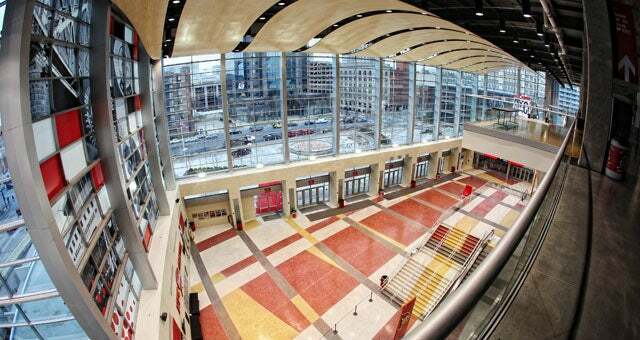 Any patron who requires wheelchair/mobility accessible, hearing or vision assisted seating may contact the KFC Yum! Center Ticket Office at (502) 690-9090. Guests that require ADA Accessibility Seating must request this at the time of ticket purchase. Disabled or elderly patrons that need an ADA accessible entrance may utilize the drop off area in front of the KFC Yum! Center on Main Street. between Second and Third Streets. Patrons will be able to access the main entrance to the facility with use of the ramps on the Norton Healthcare Plaza. The Galt House and the PARC-operated garage located below the KFC Yum! Center are the two parking facilities that allow for direct interior access to the KFC Yum! Center and are ADA accessible. Patrons parking at the Galt House garage will enter the venue through use of the Louie Link pedway system. Additional ADA accessibility parking is available in a variety of parking garages, street lots and on-street parking near the KFC Yum! Center. Please click here to visit the Parking page for more information. Audio and video recording devices are prohibited at all times from the KFC Yum! Center. The allowance of banners and posters is determined by individual show management. Banners or signs that obstruct the view of guests, obscure advertising, impede the operation of the KFC Yum! Center, contain objectionable subject matter, or are commercial in nature are not permitted. The KFC Yum! Center reserves the right to remove any banner at any time. Hand held signs are not allowed at concerts, shows and events inside the facility. The allowance of cameras vary by ticketed event. Cameras with professional lens, flash attachments or those deemed of professional quality, iPads, tablets, camcorder/Go Pro recording devices and selfie sticks are prohibited from the KFC Yum! Center. Small digital cameras may be permitted at the discretion of individual shows. 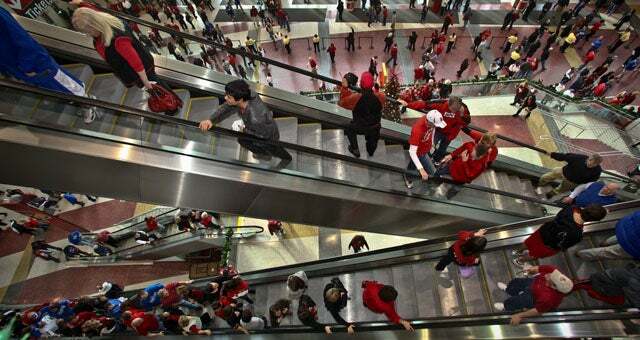 Patrons entering the KFC Yum! Center must be properly clothed, which includes a shirt and shoes. Clothing items must be worn at all times inside the facility. Purses can be no larger than 14” x 14” x 6”. Procedures for giveaways/promotions are collectively established by the KFC Yum! Center staff and facility lessees. 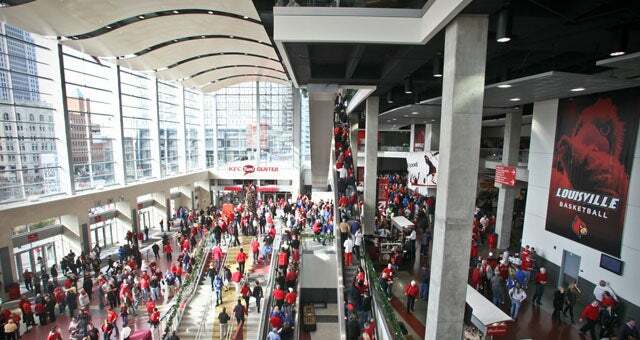 In order to provide all guests a positive and enjoyable experience when attending events at the KFC Yum! Center, we ask all patrons to please be respectful and considerate of their fellow event attendees. Guests who fail to follow the policies set forth by the KFC Yum! Center, its management and enforced by its staff or those who violate any state and/or federal law are subject to ejection from the facility. Disruptive and problematic guests should be reported to event staff personnel immediately. 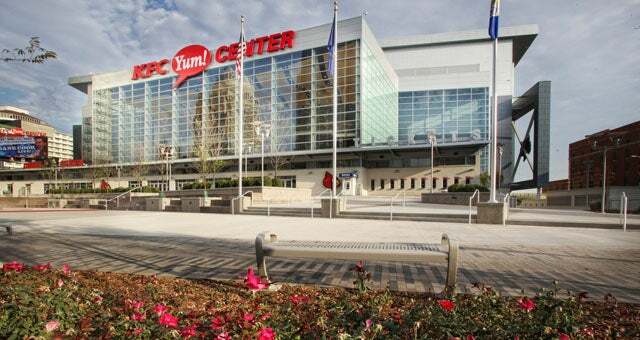 Guests asked to vacate the KFC Yum! Center may be escorted from the premises by event staff, security, facility management or local law enforcement. *Guest Services locations may close early or remain open later, based upon the needs of an individual show. Intoxicated guests are not admitted into the KFC Yum! Center at any time. Intoxicated guests are subject to removal from arena property. Items found before, during or after an event may be given to the KFC Yum! Center Security Office. Patrons may contact the facility at (502) 690-9000 to inquire about lost items. The paging of patrons inside the KFC Yum! Center is not permitted during concerts, shows and other events at the facility. The throwing of any object at any time inside the KFC Yum! Center is strictly prohibited. Any person witnessed throwing a projectile of any size is subject to ejection from the facility. Re-entry is prohibited during all ticketed events. Patrons entering the building are subject to search by KFC Yum! Center staff. Please allow extra time for security procedures when entering the KFC Yum! Center. All guests will be required to pass through a metal detector upon entry to the building. Purses can be no larger than 14” x 14” x 6” *. The KFC Yum! Center is a non-smoking facility. Smoking is not allowed in any area of the building including its exterior balconies. Electronic cigarettes are also not allowed. Soliciting within the KFC Yum! Center is strictly prohibited unless prior written approval is obtained from facility management. If a patron witnesses soliciting, contact event staff personnel immediately. The KFC Yum! Center Ticket Office is located outside the building on the east side (near Second Street) the facility and is open Monday-Friday from 10 a.m.-5 p.m. for ticket purchases and to assist with general event inquiries. The ticket office is also open on Saturdays and Sundays when a show is on sale or scheduled. The KFC Yum! Center Ticket Office is able to accept and assist patrons with any accessible seating need. For more information, contact the ticket office directly at (502) 690-9090. Ticketmaster is the only authorized third party ticketing agent for events at the KFC Yum! Center. Patrons are encouraged to be cautious if purchasing tickets from unauthorized vendors or websites. Selling of tickets in or near the KFC Yum! Center is strictly prohibited.